The high content of the essential fatty acid eicosapentaenoic acid (EPA 20:5n-3) and docosahexaenoic acid (DHA 22:6n-3) in some microalgae (e.g. 20:5n-3 in Nannochloropsis occulata and 22:6n-3 in Isochrysis galbana) have made them excellent live food diets for boosting the fatty acid content of the rotifers. Rotifers submerged in these algae (approximately 5.106 algae.ml-1) are incorporating the essential fatty acids in a few hours time and come to an equilibrium with a DHA/EPA level above 2 for rotifers submerged in Isochrysis and below 0.5 for Tetraselmis (Fig. 3.11.). However, the culture of microalgae as a sole diet for rotifer feeding is costly due to the labor intensive character of microalgae production. Most of the time the rotifers are boosted in oil emulsions (see 3.6.1.3.) and fed to the predators which are kept in green water. This green water, consisting of ± 0.2 106 algal cells.ml-1 (Tetra-selmis, Nannochloropsis, or Isochrysis) is applied to maintain an appropriate HUFA (but also other components) content in the live prey before they are eventually ingested by the predator (see also 2.5.3.). 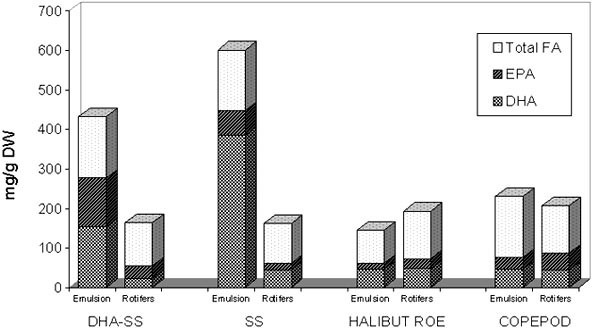 Figure 3.11 Changes in DHA/EPA ratio of rotifers in different algal media. Rotifers grown on the CS® replacement diet have already an excellent HUFA composition: 5.4, 4.4 and 15.6 mg.g-1 dry matter of EPA, DHA and (n-3) HUFA respectively (Fig. 3.12. ), which is significantly higher than for cultures grown on algae/bakers yeast but comparable in case the latter cultures are subjected to an additional enrichment treatment (Léger et al., 1989). The level of total lipids is approximately 18%. Since the use of CS® allows direct enrichment of the rotifers without the need of a cumbersome bioencapsulation treatment, complementary diets such as Protein Selco® (PS) and DHA Culture Selco® (DHA-CS) have been developed in order to incorporate higher levels of protein and DHA (Table 3.4.). The advantage of direct (or long term) enrichment are multiple; in that. the fatty acid profile obtained is stable and reproducible, the lipid content is comparable to that obtained in wild zooplankton, rotifer losses are lower and labor costs can be reduced. Table 3.4. Characteristics of some diets and emulsions containing high DHA levels (in mg.g-1 DW). Figure 3.12. HUFA levels for various rotifer productions (CHL: Chlorella sp. ; BY: Bakers yeast; PS: Protein Selco® CS: Culture Selco®; SS: Super Selco®). However, for some marine larval fishes that require still higher (n-3) HUFA levels an additional enrichment with boosters may be necessary (Table 3.4.). One of the cheapest ways to enrich rotifers is by using oil emulsions. Although home-made emulsions can be prepared with egg lecithin and fish oils (Watanabe et al., 1982). Commercial emulsions are generally more stable and have a selected HUFA composition. The first emulsions were made from (n-3) HUFA rich fish oils (i.e. cuttlefish oil, pollack liver oil, cod liver oil, menhaden oil, etc.) and emulsified with egg yolk and seawater (Watanabe et al., 1982, 1983). Recently, more purified oils containing specifically high levels of the essential fatty acids 20:5n-3 and 22:6n-3 have been used. Since the stability and storage possibility of these products is relatively low they are usually made on the spot and used immediately. For very specific applications, or when the requirements of the fish can not be fulfilled with commercial emulsions, this technique may also be used to incorporate lipid extracts from zooplankton, fish, fish roe, or other sources. A comparison of two commercially formulated (Super Selco® and DHA-Super Selco®) and two self home-made emulsified enrichment diets are given in Fig. 3.13. and 3.14. Several emulsified diets are commercially available and based on well-defined formulations. Very popular are the self-emulsifying concentrates (Selco®, Inve Aquaculture NV, Belgium) which can boost the HUFA content of the rotifers in a few hours. In this technique a rotifer suspension containing 200-300 individuals.ml-1 is immersed in a diluted oil-emulsion for 6 h, harvested, rinsed and concentrated before being fed to the predators. In view of the importance of DHA in marine larviculture, considerable efforts have recently been made to incorporate high levels of DHA and/or high ratios of DHA/EPA in rotifers. To date the best results have been obtained using the self-emulsifying product DHA-Super Selco®. Compared to the results obtained with Super Selco®, the boosting of CS-rotifers with this product under standard enrichment practices results in a threefold increase of DHA and total (n-3) HUFA. Figure 3.14. 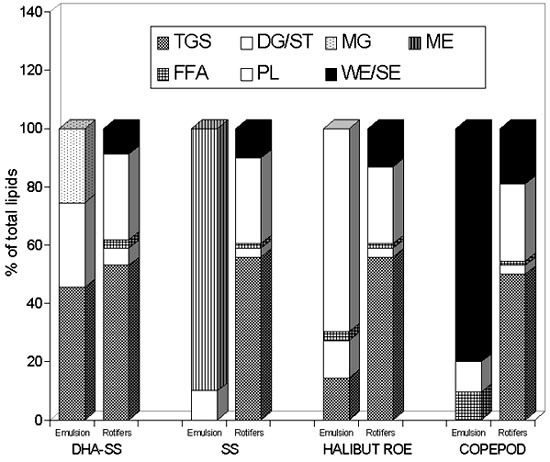 Lipid class composition in the emulsions (DHA Super Selco®, Super Selco®, halibut roe and copepods) and in the enriched rotifers.TGS: triglycerides, DG: diacylglycerides, ST: sterols, MG: monoacylglycerides, ME: methyl esters, FFA: free fatty acids, PL: phospholipids, WE: wax esters, SE: sterol esters. Furthermore, the evolution of the concentrations of EFA within enriched rotifers after being administered to the predator tanks has been investigated. Results reveal that EFA levels remain rather constant for at least 7 h under clear water culture conditions at 20°C; with only a 30% drop in DHA being noted after 12 h (Table 3.5.). Most commercial emulsions are rich in triacylglycerols and/or methyl esters and no emulsions have been formulated with phospholipids and/or wax esters. In Fig. 3.13. the most commonly used commercial emulsions are compared with home-made emulsions obtained from halibut roe and copepod extracts. Although the content of DHA and EPA is much lower in the latter emulsions, their relative concentration to total FA is much higher. It is interesting to note that after enrichment the composition of the rotifers did not differ more than a fraction of 30 to 45% in (n-3) HUFA (Fig. 3.13). Moreoever, the lipid composition of the rotifers was also little affected by the composition of the diet. However, when the efficiency of DHA and (n-3) HUFA incorporation in rotifers is analyzed it is obvious that better results are obtained with the extraction products. Since all diets are consumed with approximately equal efficiency it means that phospholipids (present in the extraction products) were more easily assimilated and metabolized by the rotifers. Table 3.5. Fatty acid concentration in enriched rotifers (in mg.g-1 DW). The vitamin C content of rotifers reflects the dietary ascorbic acid (AA) levels both after culture and enrichment (Table 3.6.). For example, rotifers cultured on instant bakers yeast contain 150 mg vitamin C/g-1 DW, while for Chlorella-fed rotifers contain 2300 mg vitamin C/g-1 DW. Within commercial marine fish hatcheries a wide range of products are used for the culture and subsequent boosting of rotifers (Table 3.6.). In general commercial-scale enrichment is scoring lower than laboratory enrichment. Problems of operculum deformities currently occurring in Mediterranean gilthead seabream hatcheries might be related to the changes in live food production management and reduced vitamin C levels. Enrichment of rotifers with AA is carried out using ascorbyl palmitate (AP) as a source of vitamin C to supplement the boosters. AP is converted by the rotifers into active AA up to 1700 mg.g-1 DW after 24 h enrichment using a 5% AP (w/w) emulsion (Fig. 3.15.). The storage of rotifers in seawater after culture or enrichment has no effect on the AA content during the first 24 h (Fig. 3.15. ), indicating that the rotifers maintain their nutritional value when fed to the larval fish during the culture run. Table 3.6. Ascorbic acid content (mg.g-1 DW) of rotifers cultured on a laboratory and hatchery scale (modified from Merchie et al., 1995). 1vit C -boosted, Inve Aquaculture N.V.
To our knowledge Protein Selco® is the only enrichment diet especially designed for protein enrichment in rotifers. The high levels of proteins allow the cultures to continue to grow and to develop during the enrichment period. Normally it is used in the same way as an oil emulsion (blended in a kitchen blender) and distributed in the tank at a concentration of 125 mg.l-1 seawater at two time intervals of 3 to 4 hours. Table 3.7. gives a comparison of the protein content of rotifers enriched with three different enrichment strategies (A: long term enrichment during the culture with bakers yeast + 10% Super Selco®; B: short term enrichment with DHA-Selco®; C: short term enrichment with Protein Selco®). Dry weight is significantly higher in rotifers enriched with Protein Selco® and similar for A and B. The protein level is significantly higher for C than B rotifers, but no significant difference can be observed between the protein level of A and C rotifers. Lipid levels are significantly higher for C than for A rotifers, but no difference can be found between C and B rotifers. A rotifers have the highest protein/lipid ratio and B the lowest ratio (Æie et al., 1996). Table 3.7. Dry weight (DW), protein and lipid levels of rotifers enriched with different diets (modified from Øie et al., 1996). Fig. 3.16. illustrates the range in amino acid content in individual rotifers. It is clear from this figure that for most amino acids rotifers are quite conservative even when they are exposed to starvation conditions. Figure 3.16. 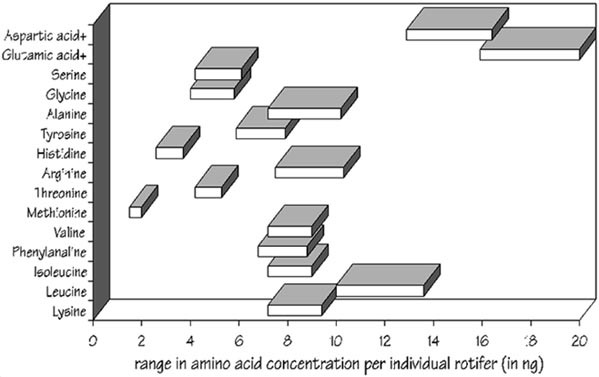 Ranges in amino acid concentration for starved (lower value) and well-fed (higher value) rotifers (Makridis and Olsen, pers. comm.). As explained earlier, the harvesting and concentrating of non-enriched rotifers should be performed in submerged filters (see 3.5.4.). Harvesting of enriched rotifers should be carried out with extreme care in order to prevent them sticking together in clumps. Especially when the enriched animals are concentrated before the washing, aeration can easily result in clumping. Instead of pouring enriched rotifers in a bucket it is therefore recommended to siphon them so as to avoid the interference of the air bubbles. Rotifers that can not be fed immediately need to be stored at a cold temperature (4°C) in order to prevent the reduction of their nutritional quality. During a starvation period of one day at 25°C, rotifers can lose up to 26% of their body weight as a result of metabolic activity. Different culture and enrichment procedures also influence the effect of starvation. For example, the starvation of gut-enriched rotifers (i.e., rotifers boosted with oil emulsions, microparticulated diets or microalgae) immediately before feeding to the predator (indirect enrichment procedure, short term enrichment) results in a very fast loss of their fatty acid content, as the animals start to empty their guts after 20 to 30 min! After about 6 hours in the larval rearing tanks, the rotifer HUFA content may have dropped to 1/3 of its original level. Tissue enrichment (direct enrichment procedure, long term enrichment), on the other hand takes place during the rotifer culture, and allows a slow but steady increase in the fatty acid content of the rotifers. This reserve in fatty acids is thus more stable and less exposed to fast decrease by starvation.